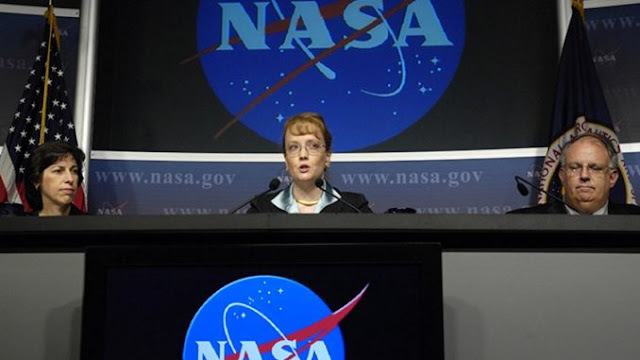 According to reports, Trish Chamberson, an official spokesperson from NASA has confirmed the existence of extra-terrestrial life and has claimed that aliens have been visiting planet Earth for thousands of years. During the two-hour briefing, Chamberson confirmed that a number of theories which had previously been dismissed as groundless speculation from fringe enthusiasts are actually grounded in reality. Chamberson made various sensational allegations in the course of the interview, claiming that the alien species known as the Greys have been visiting Earth for thousands of years and that they may have had a hand in the construction of megastructures such as the ancient pyramids of Giza and various other buildings dotted around the world. Chamberson went on to confirm various theories about alien mining operations in the solar system. She claimed one of the mines was on the far side of the Moon and that various planets in the solar system were being assessed for minerals. Recently, she claimed aliens have begun to mine Jupiter, which is why observers have been able to see several apparently new rings appearing around the gas giant. Chamberson also alleged that NASA is in regular contact with no less than four different and entirely separate alien species from various locations in the galaxy. She claimed that all contact with the alien species have been amicable. While the aliens have raised no serious bone of contention with humanity, Chamberson has alleged that they have expressed concern about the proliferation and testing of nuclear weapons which has serious consequences not only for life on Earth but for races of peoples all over the galaxy. However, Chamberson did stop short of confirming that aliens are responsible for the abductions of human beings. She said that the aliens are completely harmless, and their only interest in Earth relates to the planet’s natural resources.